Stepping off the elevator on the eighth floor of the Schulich School of Music, the sound of a full chamber orchestra fills the hall. The orchestra sounds good – very tight – with notes that are crisp and clear, and a rich enveloping sound. But on closer inspection, it turns out that there are only two violinists in the rehearsal room. 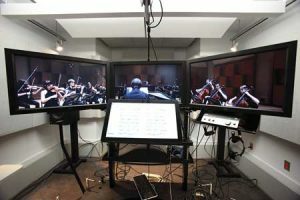 The rest of the orchestra, along with the conductor, is actually part of a recording being played back on three giant 32-inch screens that have been set up to test Open Orchestra, an immersive music system being developed at McGill with collaboration from the University of British Columbia. It’s a system that the musicians can manipulate in a variety of different ways to get the most helpful practice experience. So, say the music student plays first trumpet in a jazz band, they can mute the trumpet track and play along with the recording and hear and watch the musicians playing around them, exactly as though they were in that spot in the band. Or they can choose to play a duet with the existing trumpet track and use onscreen tools to compare their timing with that of the musician in the recorded band. They can also choose to watch and listen to the piece as the conductor hears it. in an opera or playing with a professional orchestra or it can be used by people in small towns who don’t often get the chance to practice with a serious orchestra. “This is an ensemble that will never fail, never make a mistake, so it makes it a lot easier to practice with,” says Wieslaw Woszczyk, James McGill Professor of Sound Recording and the Founding Director of the Centre for Interdisciplinary Research in Music, Media and Technology. He is responsible for developing the audio component of Open Orchestra. He worked alongside John Roston, the project coordinator and lead researcher for the video component, and Jeremy Cooperstock, a professor of computer and electrical engineering at McGill, who developed the software and took on the network engineering tasks that make this new music tool viable. Funded largely by CANARIE, Canada’s Advanced Research and Innovation Network, the project builds on the trio’s earlier explorations into the possibilities offered as more bandwidth becomes available on the Internet in future. After developing the tools to do ultra video conferencing, and sign language interpretation at a distance during medical treatments, the trio then turned their attention to using the possibilities of the internet to teach music. 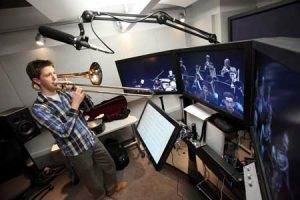 During this test phase of Open Orchestra, musicians have been giving feedback on three series of recordings: one jazz series; one set of chamber music recordings; and a set of recordings for opera students. So far the results have been encouraging. “It feels very engaging, like playing with a real chamber orchestra,” says Ewald Cheung, 2010-2011 recipient of the Schulich School’s Golden Violin Award.